Jan Constantine is delighted to launch her new classic Christmas Collection. Following on from her highly successful Alpine Collection, Jan has created a magical wall hanging to set the scene and added some beautiful edelweiss floral designs in red and duck egg blue felt wool, perfectly complimenting the existing Alpine pieces. 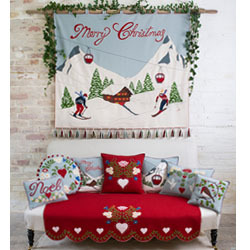 There’s also a fabulous range of festive bird embroideries, many inspired by the famous Christmas song: ‘On the First Day of Christmas my true love gave to me ….’ There are swans, partridges, doves and the national favourite, the robin, all appliquéd onto cushions, Christmas stockings and spice hearts. Expertly appliquéd upon felt wool in Jan’s signature style, these pieces are unique works of art, to be displayed and loved year after year at Christmas.